THE CARDIOVASCULAR PATIENT - CHALLENGE OR PROBLEM FOR THE DOCTOR OF DENTAL MEDICINE? Hristo Daskalov*, L. Vladimirova-Kitova**, Hristina Lalabonova*. The pain is a main and strictly subjective criterion for the patients’ assessment of the quality of treatment. The anesthesia is the basic part from the contemporary standards for good dental practice. Object of the study are 276 interviewed patients from the Clinic of Cardiology - St. Georgy University Hospital - Plovdiv, The Department of Cardiology - MBAL - Pazardjik, and private cardiological practices in Plovdiv, Smoljan and Pazardjik. For that purpose a questionnaire was prepared. 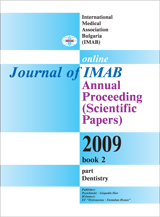 It comprises questions about retrospective revision of previous dental interventions. The questions are orientated to specify the use of an anesthesia in the dental treatment, how far effective is it, if there is a refusal on the dentist part. Key words: cardiovascular diseases, risk patients, complications, anesthesia.